TOW BEHIND.. RIDE ON TIP TRAILER... A TRUE WORKHORSE!!! At this price these trailers are fantastic value and rival those that are double this price!! 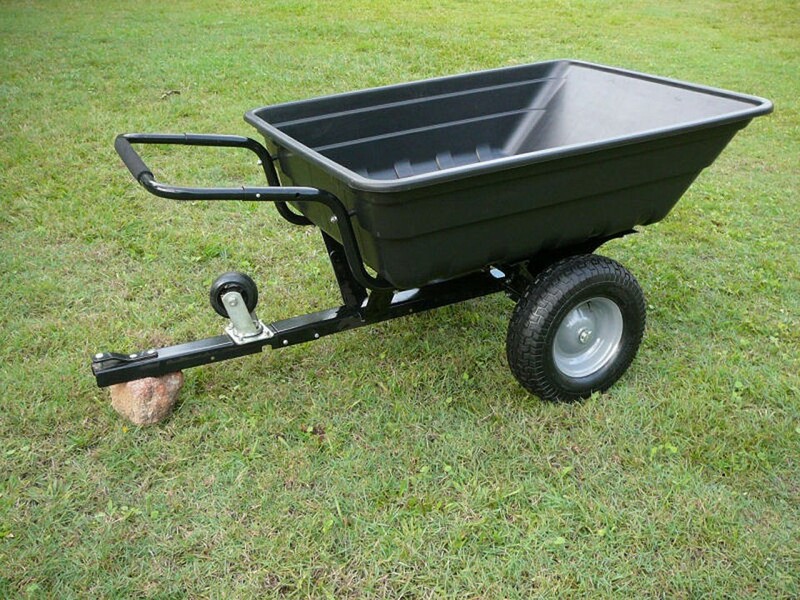 Ideal for towing behind a ride-on or quad bike, this trailer also doubles as a wheelbarrow. The heavy duty poly tray will not rust and has a massive load capacity of 300kg. It also has a quick release latch on the tub so that you can tip and dump your load. Dual bearing 16" wheels (16 x 6.5 - 8) : Large and Wide, makes for easy manoeuvrability! Large 1" Axle : Tough enough to handle big loads without bending! Heavy Duty Poly Tray 120cm x 93cm x 31cm : Takes even your largest items! Over 200L carrying capacity : Move more in one load! Sturdy black powder coated steel frame : Keeps it looking better for longer! Tilt tray : Makes unloading a breeze! Please note this item comes unassembled for ease of transport. Box for the metal parts & wheels is L 80cm x W 48cm x H29cm. With 1 year warranty for ease of mind.